At Furlong Fashion we keep the fashion conscious well shod, from turf to dance floor. With racing season upon us, make sure your look is first out of the gate. Whether you are attending an afternoon on the AW at Southwell or a glorious day out on the turf at Royal Ascot there is nothing like dressing for success. With less than 24 hours to go until we are dressed in our finest, sipping on that first glass of chilled Champagne, let's shift our focus from outfit to accessories to ensure your total look is pulled together to perfection. Kaleidoscope is the perfect destination to find that last minute outfit for the races. Their range of fantastic bags and accessories will transform you look without breaking the bank. Kaleidoscope kindly sent me a selection of accessories to wear at the races, including a fabulous black and gold box clutch. I am definitely looking forward to styling them for a day at the races. Below are my favourite Royal Ascot worthy outfits sure to get you in the mood for an action packed week of horseracing, fun and fashion. Springs favourite print gets darkly dramatic with this simple floral shift dress. shape for flattering effect. 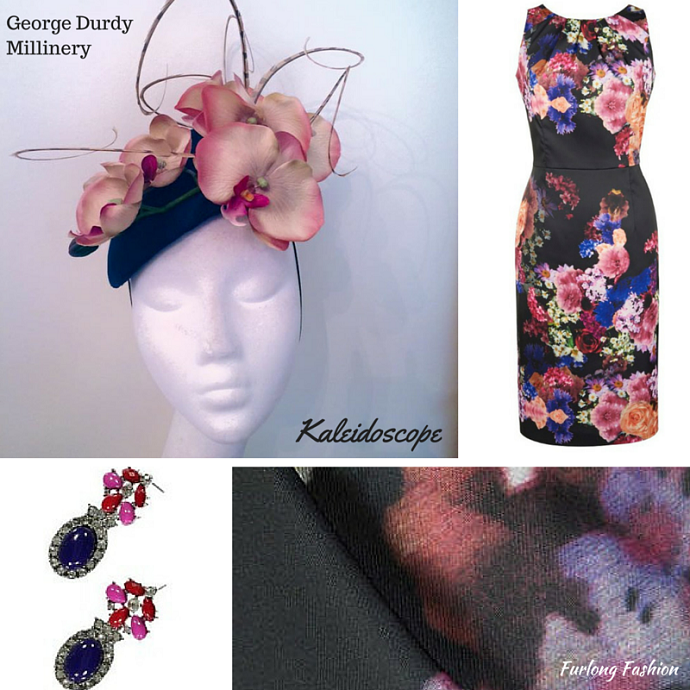 Complimented perfectly with this silk George Durdy hat with beautiful orchid detail and simple droplet earrings. This red dress offers a feminine chic effect, with its delicate lace overlay and flattering sleeves. Red is a classic colour choice, ideal for the races, with the gold antique cuff and ring (comes in a three piece set) being the perfect colour to compliment compliment any day or night look. A wonderfully elegant fit and flare style in a beautiful pastel floral print. With flattering layering at bodice and silver trim detailing, accessorised with a aztec style cut out cuff. Worn with an beautiful lilac floral Jenny Roberts hat! This outfit is fun and feminine, perfect for any ages. Capturing the feminine charm of the 50’s, this dress offers the perfect amount of coverage for the Royal Enclosure. Teamed with this exquisite box clutch and simple bright gold earrings. finished off with a wonderful black Dawn Guibert creation. This look is sure to get you noticed. Add a little sparkle to your outfit with this diamanté choker and bracelet, they are the perfect accessories to add that extra glamour to this sophisticated shift dress. The horse bit belt give this look a subtle equestrian vibe. Paired with an elegant Cara Meehan design. I will be taking over Kaleidoscopes twitter feed on Ladies Day at Royal Ascot so make sure you follow to see the fashion as it happens. 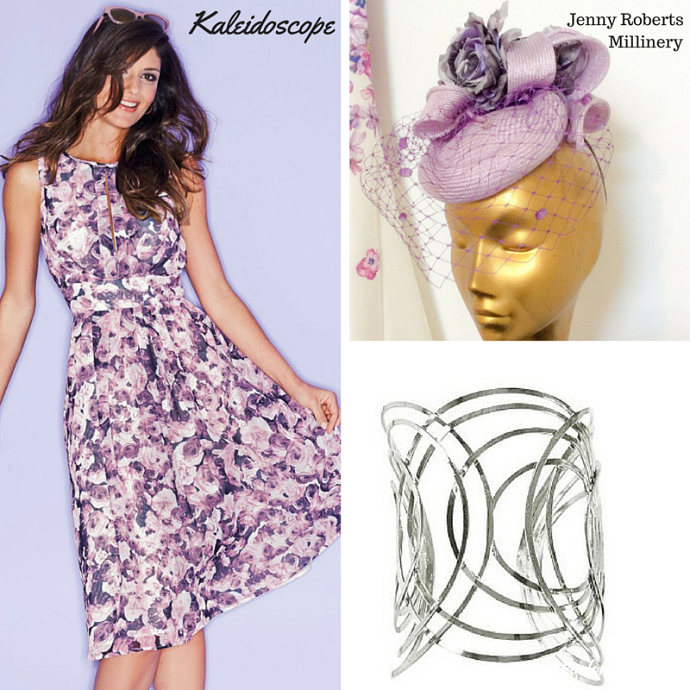 Tweet #LadiesDayWithKaleidoscope to @Kaleidoscope_UK with your Royal Ascot photos, we would love to see what you are all wearing! Royal Ascot Formal Dress Code.